With two months of successful playtesting behind us, we are pleased to finally announce Release 20180923. The new release brings players up to date with development from January to July 2018, which includes some interesting new features and welcome fixes despite a significant reduction in our development manpower. 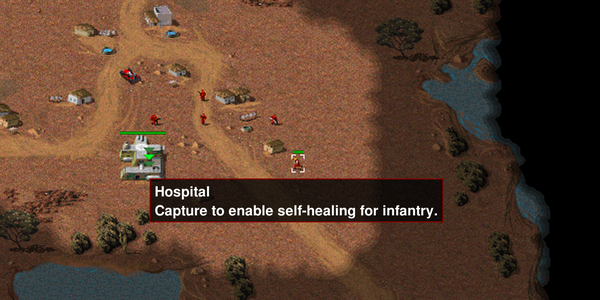 One of the themes in this release is integration: a new player account system bridges your in-game persona with the OpenRA Forum; improvements to the game client and server infrastructure enable a more usable online server list, and a new strategy for Linux packaging allows us provide baseline support for more players while reducing our maintenance burden. Players can add badges to their profile to show their achievements or preferences. 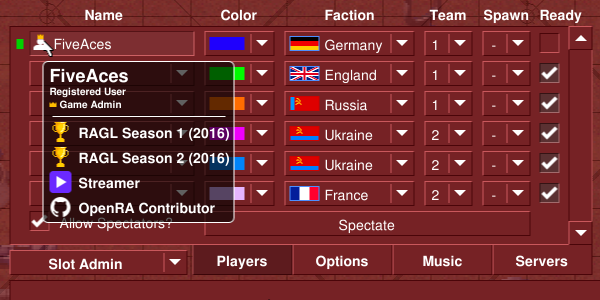 Connecting to your OpenRA forum account allows you to verify your identity to other players without revealing your IP address. You can also choose to display up to five badges, with a selection of default options and custom awards available to choose from. Server hosts can configure private clan or tournament servers based on accounts instead of using passwords. 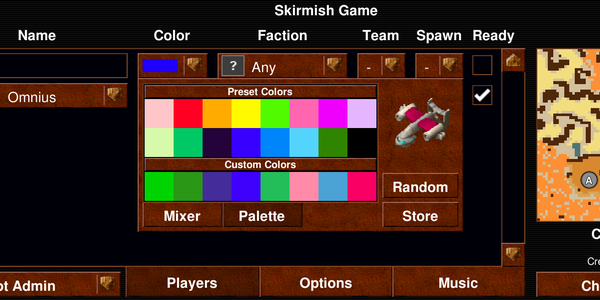 Other improvements to the in-game UI include a new preset- and custom-color tab on the color chooser, the ability to select in text-fields using the mouse, and returning you to the appropriate sub-menu (instead of the main menu) after leaving a game. The color chooser now allows you to save and restore your favorite colors. The new AppImage package format allows us to provide “upstream” releases that should work on all modern Linux distributions. These self-contained packages do not require installation, and so you can keep multiple versions on your system in order to join servers or watch older replays. AppImages can be integrated into your system (adding launcher shortcuts and version updates) by installing the appimaged daemon. If you prefer traditional packaging systems, we encourage you to try out community-supported packages for your distro. Mouse-over a capturable tech structure for a description of what it provides. As always, we suggest you read the changelog for more complete information, and head over to the download page to get started with the new release! Our investment in the SDK over the past 18 months is paying dividends with impressive community projects now under development. We would like to highlight the recent release of Shattered Paradise, which gives players a first look at Tiberian Sun on OpenRA, and the impressive progress of the KKnD Remake project. The KKND project aims to remake KKND 1 and 2 using the OpenRA engine. IceReaper, classic RTS enthusiast and lead developer of the KKnD remake, has also started a video series that illustrates from first principles how to reverse-engineer the asset formats from an old game (Earth 2140) and build a stand-alone remake using OpenRA. We recommend following this series as it develops if you have some programming experience and would like to learn more about reverse engineering and creating projects using OpenRA. KKnD looks really good, at least just for the unique mechanics in it if nothing else. Units do feel nicely responsive too! I guess you could say OpenRA is the Future. Regular RA2 modders haver already played with OpenRA's possibilities. Asin, the ones with brain and knowledge. The great Graion still tall and mighty on his chair, talking his mouth off, as usual. Then again, I'm better off looking for that information myself than asking you lot. Then again, I'm better off looking for that information myself than asking you. What I needed, thank you.